So, our son Liam (11 years old) has been really into everything Native American lately. He has some Native American ancestry, and the knowledge of that has really sparked something in him lately. He's been wanting to bow-hunt, fish (he wishes he could spear), and he's been asking for some Native American style apparel. This kid is SUPER picky about his clothes... all the rest of the kids- they don't care; Liam- it has to fit just right AND be his style. I try to accommodate when I am able, but a lot of local stores don't supply his specific requests. He wants moccasins, a native styled hoodie, and pretty much anything that resembles or reminds him of Native culture. Well, I hopped on over to Groupon Goods to see if I could find a good deal on any of those things, and I found a really cool sweatshirt that I know he'll love. 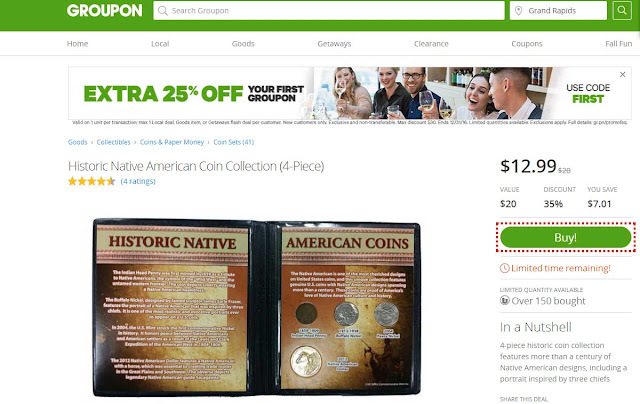 I also found this sweet Native American coin set that I think will be a great Christmas gift (you can never start too early... it isn't that far away)! Sometimes you just have to turn to online shopping to get a decent deal and find what you are looking for! Fun filled grab bags for Halloween!